Ricki has gained 24 pounds to date, she is averaging 3 pounds biweekly. All three babies and the mommy are doing great. 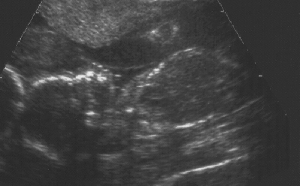 The doctor estimates the babies are approximately 12 ounces each, which is around the size of a single nineteen week pregnancy. The babies have rearranged in Ricki's uterus. 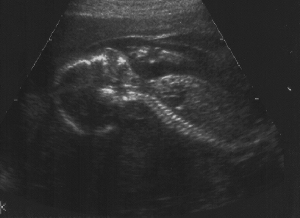 If you look back at the 13 week sonograms they were positioned in the shape of a triangle (one on top, two on the bottom). Now they are positioned in the shape of an upside-down triangle with the boy at the bottom and the two girls on the top. Also, two of the babies are in the breach position, but since Ricki is having a C-section that should not cause any problems. 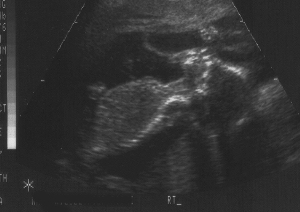 Position of triplets in uterus.